Instruction on the Duty of Prisoners. By a Catholic Clergyman. Sydney: Printed by A. Bent, at the Australasian Chronicle Office. 1839. White, William. 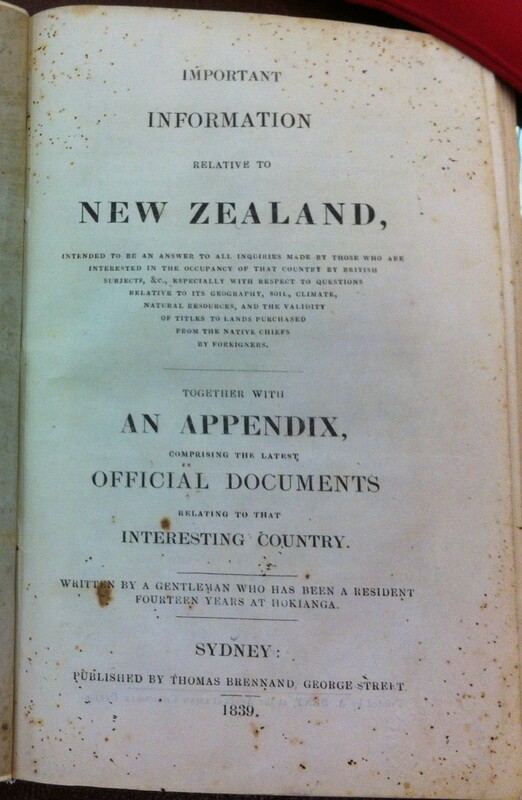 Important Information relative to New Zealand, intended to be an Answer to all Inquiries made by those interested in the Occupancy of that Country by British Subjects, &c., especially with respect to Questions relative to its Geography, Soil, Climate, Natural Resources, and the Validity of Titles to Lands purchased from the Native Chiefs by Foreigners. Together with an Appendix comprising the latest official Documents relating to that interesting Country by a Gentleman who has been a Resident fourteen Years at Hokianga. 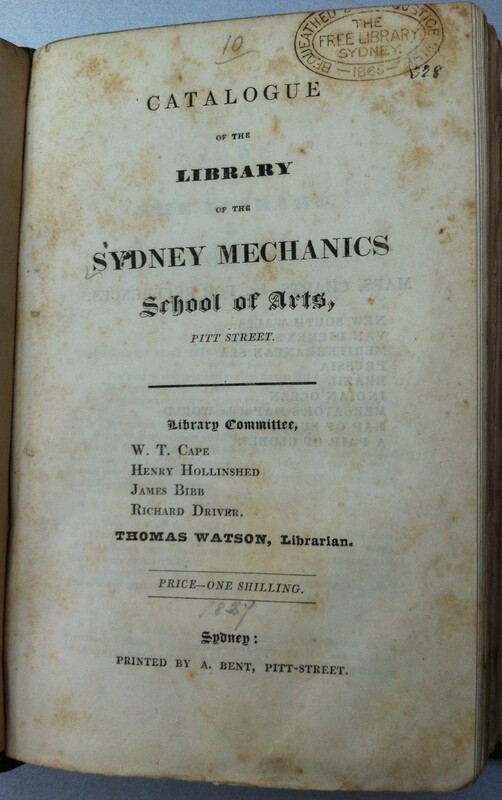 Sydney: Published by Thomas Brennand, George Street. 1839.
viii, 56, [ii], xxvi pp, 21 x 13.5 cm. Brown paper covers, with title reprinted on the front. Colophon: Printed by A. Bent, at the Australasian Chronicle Office. Ferguson 2898. Copies: ANL (4 copies); BL; DL (2 copies); KCL; ML (3 copies); several copies in New Zealand libraries. The author and compiler was Rev. William White. Publication announced in the Australasian Chronicle 29 Nov. 1839. To be had of all Booksellers, and at the Australasian Chronicle Office, 67 Pitt-street. Assume printed by Bent as advertised together with the two previous items. 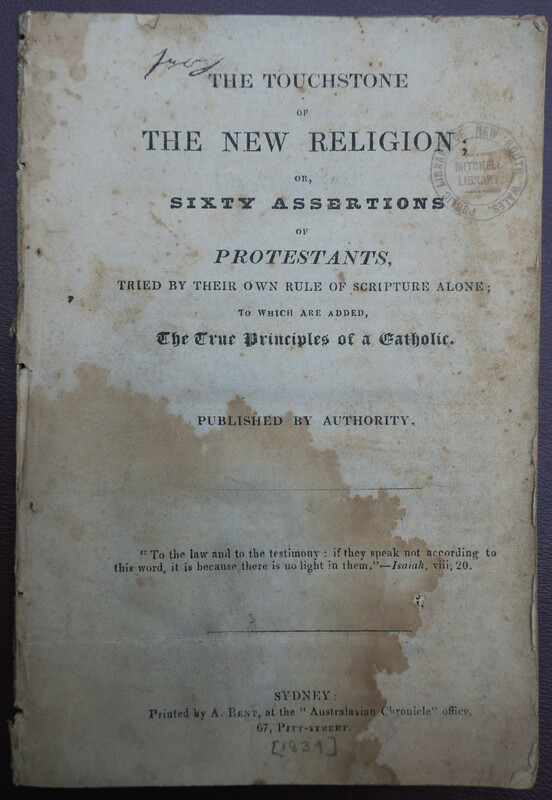 The Touchstone of the New Religion; or, Sixty Assertions of Protestants, tried by their own Rule of Scripture alone; to which are added, the true Principles of a Catholic. Published by Authority. Sydney: Printed by A. Bent, at the “Australasian Chronicle” Office, 67, Pitt-Street. 22 p., 17 x 11.5 cm. 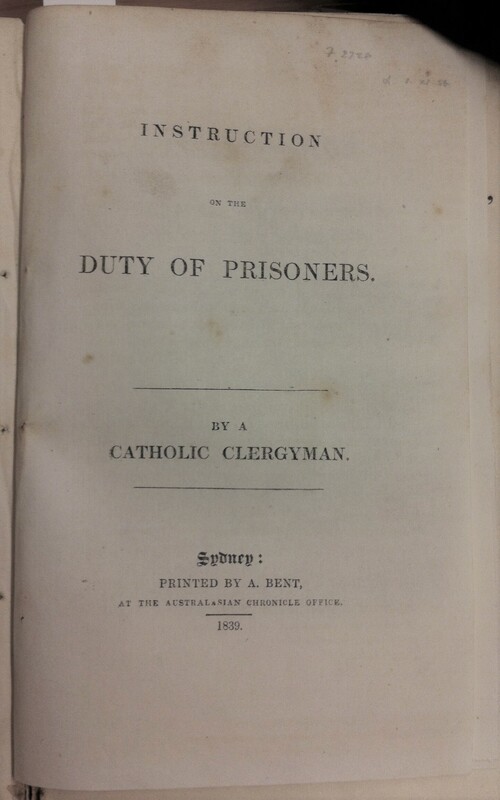 Reprint of an eighteenth-century work by English Catholic Bishop Richard Challoner. 28 p., 21.5 x 31.5 cm. Bent’s printing office was at 67 Pitt-street, directly opposite the School of Arts building. Broadside. 33 x 21 cm. Printed for Francis Low, who would have known Bent quite well from Hobart, where in 1835 he was the debt collector for Gilbert Robertson’s newspapers. Prospectus probably printed in July 1839 according to Low’s interesting advertisement in the Commercial Journal and Advertiser on 6 July. MODEL OF SYDNEY. MR. FRANCIS LOW begs respectfully to inform the inhabitants of Sydney that he has now got all the preliminaries completed, and will forthwith commence work, when he humbly begs the indulgence of the public in allowing him to take the dimensions of their respective premises, in order that they may be correctly modelled. Each section of the Town will be exhibited as it is completed, according to his Prospectus, which, will be published in a few days. From the experience Mr. Low has had in constructing the Model of Hobart Town, which was done entirely by HIMSELF ALONE, unassisted by Mr. Peck, or any other individual whatever excepting his own family, he feels confident in assuring the public that his Model of Sydney will be in every respect the superior, as he is now free from the trammels of a capricious employer. 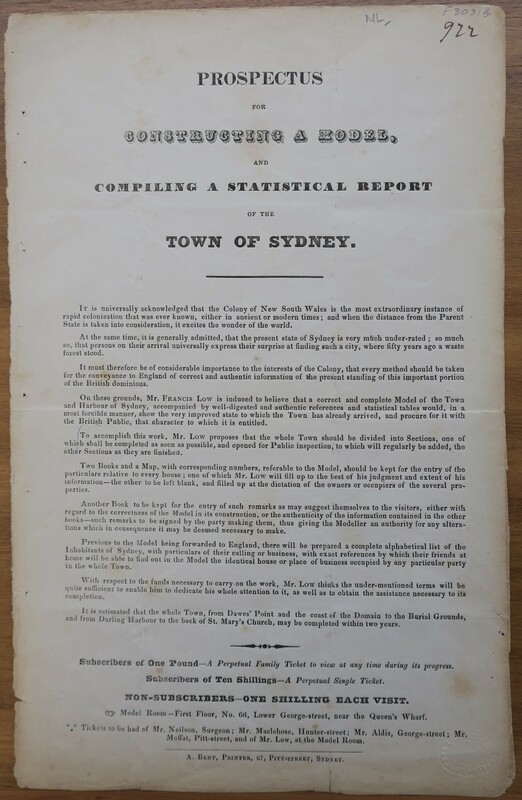 Prospectus also printed in Sydney Gazette 22 Aug. 1839.